While not everyone may agree that dogs need eyewear, veterinary ophthalmologists are one in saying that certain breeds and types of dogs can benefit a lot from the best dog sunglasses and goggles. Protecting our dogs’ eyes from injuries due to UV rays and dust, debris, or any other particle is a must if we want our hounds to live healthier lives. And in case you’re wondering what are currently the best dog sunglasses and canine goggles in the market today, we’ve got you covered. One of the best dog goggles you’ll ever find in the market is this pair of spectacles from QUMY. With a durable yet folding frame that hugs the contours of your pet’s head, made even more fitting by its deep cup design, this is one canine goggle that is guaranteed to have your pet enjoying a ride around town with the windows of your car rolled down. It also makes for excellent dog motorcycle goggles especially since the QUMY is designed for hounds that weigh over 15 pounds. Its highly-protective design hugs the eye socket like the goggles of a deep sea diver, allowing no debris or particle to ever get on the surface of your pet’s eyes. You’ve got 6 lovely colors to choose from, too, giving you the added benefit of choosing one that matches your dog’s style. Looking like the aviators of the early 20th century, the Enjoying dog goggles are truly marvels to look at. The lens frame is fully padded so your dog will not have that classic circular patch around its eyes once you remove the dog shade. This venerable dog eye protection is perfect for ensuring your pet will not have its eyes harmed by UV rays, dirt, dust, particles, or even water and wind. It only comes in black or pink, however, substantially limiting your choices. At least you can always go for the pink in case you have a girly dog in tow. 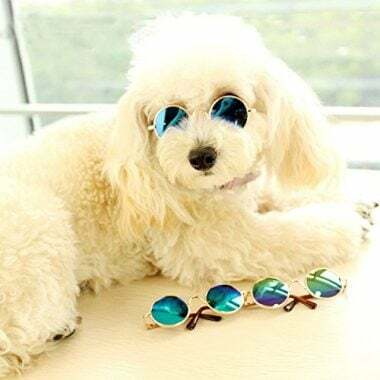 It is important to recognize that the Enjoying is best for small dog breeds such as Chihuahuas, Poodles, and Bichons Frise among others, making it a worthy small dog sunglasses. There’s no denying that the Doggles ILS dog glasses are one of the best-looking and sturdily-built pair of canine goggles you’ll ever see. 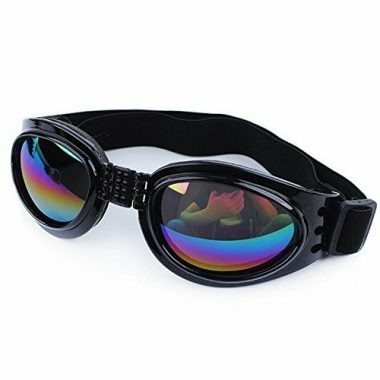 While it is designed more like a swimmer’s goggles, you know that it is primarily intended for dogs when you see that it also comes with an adjustable chin strap in addition to the band that wraps around your dog’s head. The nasal bridge is made to be especially wide allowing for full adjustability while the lens frames are designed to be as robust as any professional-grade goggles. The lenses, while not made of premium glass, are constructed of high quality materials that are designed to be shatterproof. They have exceptional UV protection, too, and will not turn hazy in high humidity. The good thing with the Doggles is that it is part of an interchangeable lens system, allowing optimum versatility when needed. Designed like a cat eyeglasses, albeit with its lower rim having a sharper, more defined angle, the Namsan pet sunglasses makes its way into this list because of its fun and stylish approach to canine eyewear. You’re welcome to try the pink, although there are 6 other color designs you can choose from. It’s got all the features of a highly-protective canine eyewear so if you’re looking for dog motorcycle goggles or simply a fashionable dog glasses, the Namsan fits the bill. The nasal bridge comes with a folding and lockable design, allowing for ease of storage. The UV and debris protection for your dog’s eyes is also remarkable, thanks to the use of a tough yet lightweight frame and lens combo. It only comes in one size, though so it is imperative that you measure your pet’s head dimensions accurately. Unlike most of the pet sunglasses and goggles we have in this list the HelloPet is unique in that it comes with a single lens design, eliminating the need for a nasal bridge. Much more like a ski mask the single lens design of the HelloPet allows for greater unobstructed views. One might think that the snout of dogs will be a major obstacle for the secure fit of the HelloPet, but judging from the experiences of pet parents it fits perfectly. This makes the HelloPet one of the best dog goggles in the market. The polycarbonate lens is designed for optimum protection for your pet’s eyes while integrating dual air circulation holes in its design, bringing cool and comfy air around your pet’s eyes. The soft sponge padding also helps provide for a more comfortable fit. The only downside to the HelloPet is that it only comes in 2 color options as well as a single size. Pet Leso’s cat eyeglass design looks hipper and chicer than the Namsan, although it also comes in a square frame. The shatterproof lens is standard as well as the form-fitting padded frame. Designed for medium and large dog breeds, this dog shade also makes for a great dog motorcycle goggles especially if you include a matching helmet for your hound. It’s made of reliable and sturdy materials complete with a wide elastic head strap that works well with the attached chin strap. Available in black, red, and gray, your options may be limited but this is not an excuse for not considering the Pet Leso for your dog’s eye protection. The Doggles ILS in Pink Frame is similar to the Doggles ILS we featured above with the only difference being its pink frame. That being said, you also get the same shatterproof design of its lens, the flexible padded frame, and a wider nasal bridge. It’s also available in 5 different sizes so you can have the security of better fit for your pet. Of course, the pink frame and lens should look lovely on a hound that has all the girly qualities of an adorable Lady waiting for Tramp. Fans of John Lennon or Prince can rejoice in the small dog sunglasses designed by Cydnlive. It’s a canine eyewear that is a blast from the past, bringing to fore one of the most iconic shapes of eyewear frames ever. It could very well be one of the best dog sunglasses because of its looks. Unfortunately, when it comes to protecting your pet’s eyes, there really is much to be desired from the Cydnlive. First, there are no straps to secure the glasses around your pet’s head. Second, its circular frame design means that dirt and dust can still enter your dog’s eyes from the sides. Third, there are no indications that it can protect your pet’s eyes against UV rays, too, although the lens itself can be colored. Technically, the Cydnlive is more of a fashionable canine eyewear than it is a protective piece. It’s great for photo shoots, however. This pair of dog eye protection follows the classic oval design of eyewear frame and embeds it with shatterproof polycarbonate plastic to help protect your dog’s eyes. It’s perfect for canines that weigh at least 13 pounds, although we found the size to be a lot bigger than usual. As such, we fully recommend the Top-Elecmart to be used on medium and large dog breeds, although you can also check the dimensions of their pet glasses to have an idea whether it fits your dog or not. Overall, pet parents are happy with the way the Top-Elecmart fits onto their pets’ faces. The design looks fashionable, too. It is easy to pick the best dog sunglasses and goggles if only you know what you need to look for. Unfortunately, because almost every other piece of protective eyewear you’ll see in shops comes with almost the same specifications you may want to modify your search a bit by focusing on the things you absolutely should avoid when buying dog sunglasses and goggles. Under no circumstances are you going to buy an eyewear for your pet that is too loose or too tight for your dog. Fit is one of the greatest concerns of pet parents as too tight and it will be very uncomfortable for your pet; too loose and you’ll just be wasting your money since it can easily get lost. While many dog goggles and glasses come with straps, stay away from those that do not have adjustable straps as you’ll be stuck with a single size. The nasal bridge should also be considered in relation to the width of your pet’s muzzle just between its eyes. The main reason why these eyewear pieces are called as sunglasses is because they have specialized coatings that help them bounce off UV rays from the surface while allowing visible light to reach your pet’s eyes. In the same manner as human sunglasses are made, you’d definitely want something with UV protection for your pet’s eyes. That being said, you need to look out for dog glasses that are merely colored plastics. 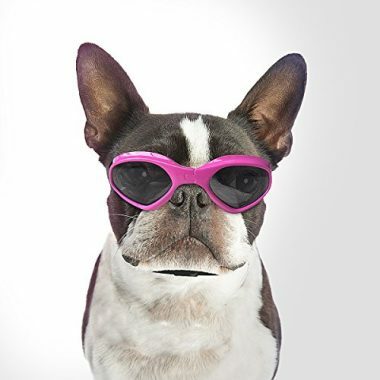 These may look like sunglasses, but they will never provide your dog with ample UV protection. Excellent choices will be those with UV 400 rating as these can help assure your dog of optimum protection for its eyes. 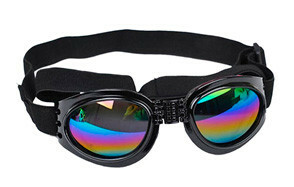 Goggles are designed specifically to protect the eyes from physical harm. While the lens can shield the front of the eyes, debris and other particles can still get into the eyes through the sides of the frame. If you want to protect your dog from debris or airborne particles that may be carried by the wind, then you should steer clear of sunglasses and goggles that do not form a tight fit around your dog’s eyes. If there is no foam or shield that will help deflect these particles away from your pet’s eyes, then it’s best to skip this product. If you’re looking for props to use in your dog’s next photo shoot you don’t actually need straps. However, if you are looking to put these protective eyewear on your dog when traveling or heading outdoors, then it is a must that you stay away from products that do not have head and chin straps. These are the only mechanisms that will help ensure the eyewear stays in place. Without these, your dog will easily shake it off its head. Not everyone is convinced that dogs should also wear sunglasses or even goggles. However, experts actually have this to say: dogs need protection for their eyes more than they do to look fashionable and chic. Here are some of the benefits of using dog sunglasses and goggles. One of the most important benefits of dog goggles is that it protects the eyeballs from ulcers, abrasions, and cuts. This is especially true for breeds that have otherwise protruding or bulging eyeballs such as Boston terriers, Pugs, and Shih Tzus as well as other dogs that are considered as brachycephalic. These dogs have relatively short muzzles that also shorten the distance between their nose and their eyes. This relatively short distance can expose their eyes to the abrasive edges of grass, sticks, and other debris as they sniff around the yard. It also protects your pet’s eyes from dirt, dust, debris, or any other particle that may get onto the surface of the eyes. Certain dog breeds like Greyhounds and German Shepherds are prone to a type of autoimmune disorder known as superficial keratitis, otherwise called pannus. The UV rays from the sun have been shown to worsen the inflammation in pannus which can lead to a reduction in visual acuity of dogs. Having dog sunglasses with appropriate UV protection can help minimize the entry of harmful UV rays into the eyes and help alleviate the inflammation seen in this kind of eye disease in dogs. Dogs that undergo eye surgery for the removal of cataracts or to correct a defect in the cornea can also benefit from dog goggles. Successful healing is predicated on the idea that no further irritants and contaminants are added onto the healing tissues. Even if dogs were put in isolation so that wind and environmental factors will not affect the healing process, they can still scratch their faces and inadvertently scratch their eyes, too. Different canine diseases can manifest as pain or discomfort in the eyes. While rare, squamous cell carcinoma of the ocular surface can produce pain. Corneal abrasions, keratoconjunctivitis sicca, conjunctivitis, glaucoma, and entropion are also common eye problems of dogs that present with either discomfort or pain as its main clinical manifestations. When the eyes are in pain the natural tendency of dogs is to scratch it which can further aggravate the condition. 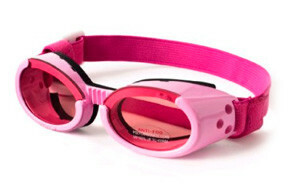 Having goggles can help protect the eyes and aid in the management of pain and discomfort. Dog sunglasses are, as the name implies, just like eyeglasses but with specialized coatings to help protect against the sun’s rays. On the other hand, dog goggles are pieces of protective eyewear that not only protect the front of the eyes but also the sides. 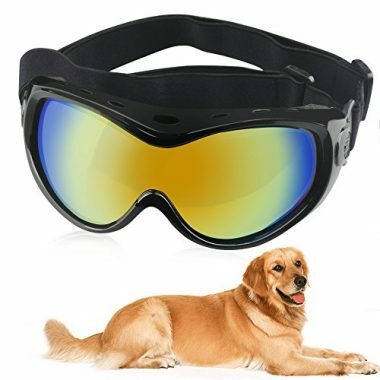 Goggles form a protective enclosure around the dog’s eyes so that debris, water, wind, particles, or anything at all will not enter the dog’s eyes. Strictly speaking, sunglasses have open sides, allowing particles or debris to enter and still irritate the dog’s eyes. Goggles, by design, have side enclosures to prevent debris from getting inside. However, these do not have UV-protective coatings. As such, there are now dog goggles that combine the two features: UV protection and debris protection. 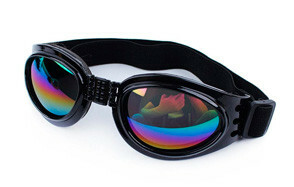 These are goggles that have specialized UV-protective coatings similar to a conventional sunglass. Since dog glasses and goggles are worn around your pet’s head and directly in front of the eyes, there are two measurements that you need to take corresponding to the lengths of both the head and chin or jaw straps. First, get a tape measure and wrap this around your pet’s head, across its eyes and just under its ears. This is your pet’s head circumference. Second, place the tip of your tape measure under one of your dog’s ears. Now wrap the tape measure under its chin and pull it towards the bottom of the other ear. This is the length of the chin strap. You can then use this information to find the best size of canine goggles for your pet. Remember, it is better to get something that is larger yet fully adjustable than one that is already too tight for your pet even when adjusted. Q: Why does my dog need sunglasses? A: Dogs need sunglasses to help protect the eyes from the glare of the sun. This is especially true for certain breeds of dogs that are prone to developing pannus as well as other forms of eye damage secondary to sun exposure. 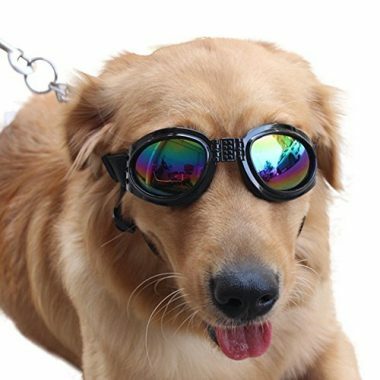 Dog goggles, on the other hand, also protect the dog’s eyes against debris or particles that may be carried by the wind as well as smoke and pollution and other objects that may come in contact with the surface of the eyes. Q: How to train a dog to wear sunglasses? A: Not all dogs like the idea of having a contraption right in front of their eyes and wrapped around their heads. However, if you’re able to properly train your pet you’ll find that it will not resist you once you attempt to put it on its head. To do this, you need to introduce the sunglasses or goggles slowly, making sure that your pet accepts it as a natural part of its personal items. Put the goggles onto your pet’s head and offer praises if it will not attempt to get it off. Be ready with your treats so it associates the wearing of the goggles with something pleasurable. Bring your dog outside, but most especially when the sun is shining brightly. It should immediately notice the difference between having the goggles or sunglasses on and not wearing them at all. Be patient in doing this routine many times. It needs to associate wearing the sunglasses as a naturally good thing for it. Q: Are dog sunglasses/goggles safe for everyday use? A: Sunglasses should only be worn outside where there’s the sun. Indoors, they’re best taken off. 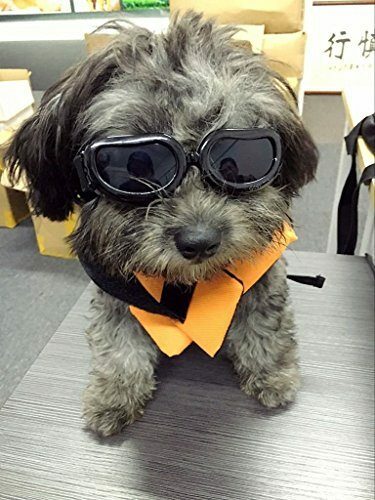 However, if there is a medical need for wearing canine goggles or sunglasses and as long as you have trained your dog to use it, then it should be fine for your pet to use it indoors and on a daily basis. However, it is important to check with your vet because you also don’t want the eyewear to adversely affect your dog’s activities of daily living. 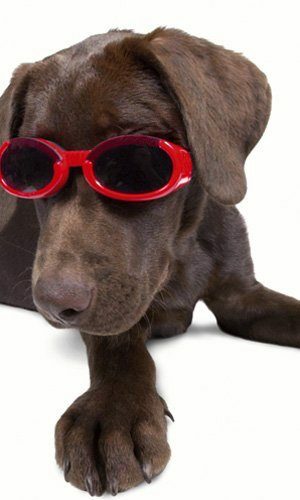 For dogs that will benefit from the medical indications of goggles or sunglasses, it is best to keep wearing these until the health problem has been resolved or until the vet deems fit. Q: Can I replace the lenses on my dog’s sunglasses? A: Depending on the dog sunglasses or goggles that you bought, you can or cannot replace the lenses. 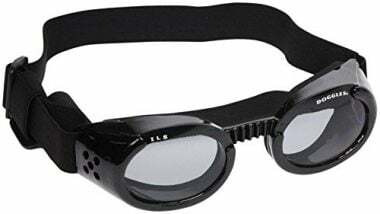 For instance, goggles that come with the interchangeable lens system actually allow you to easily replace the lens anytime to suit a particular purpose. For instance, if the sun is already setting, there clearly is no need for a dark-colored lens. Instead, you need something clearer or more transparent. Interchangeable lens systems give you the versatility to replace the lenses instantly. Sadly, not all dog sunglasses come with such a design. You can still replace the lenses, however, but you will need an appropriately-sized lens that matches the frame. 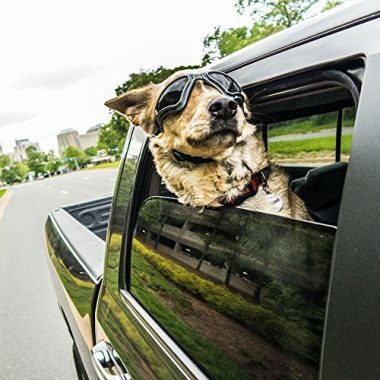 HelloPet, Doggles, and QUMY were our top 3 in this list of the best dog sunglasses and goggles. And while it is easy to see that the Doggles can be runaway winner because of its exceptional design and amazing UV protection, we find its price tag to be more on the heavy side for a canine eyewear. The same is true with the HelloPet which was slightly more expensive than the Doggles, although we can honestly say that its technical features are well worth the hefty price tag. Overall, however, we picked the QUMY Dog Sunglasses because it provides a more affordable solution to the need to protect our pets’ eyes both from UV rays and particles while also giving us the versatility to choose from 6 different color options to match the personalities of our pets. It’s got superb UV protection, too, plus adequate protection against debris, water, and wind while ensuring that the lens will never fog and shatter. It’s the perfect combination of form, function, and affordability that pet parents look for in a canine protective eyewear. Dogs need protective eyewear like sunglasses and goggles. While not everyone may agree with the fashion-related purpose of dog sunglasses, everyone recognizes the fact that these protective gears can help improve the lives of our pets by keeping their eyes in their optimum state of functioning.